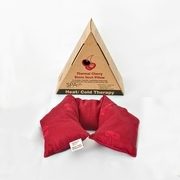 Cherry Stone Thermal Neck Pillow. Perfect for both hot and cold use. Beneficial heat that lasts and lasts. Use as a cold compress for bumps, sprains and more! 21.5 x 5"w.